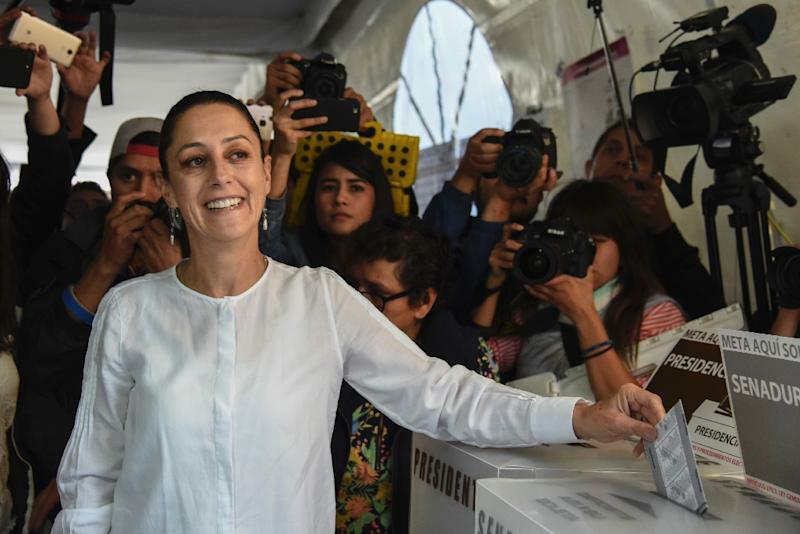 Mexico City (AFP) - The first woman elected mayor of Mexico City was sworn in Wednesday for a six-year term leading one of the world's largest cities, in a country with a deep tradition of machismo. Claudia Sheinbaum, a 56-year-old scientist and environmentalist, rode to victory in the July 1 elections on the same anti-establishment wave that brought her left-wing ally and former mentor to power, Mexico's new President Andres Manuel Lopez Obrador. She echoed Lopez Obrador's fervent anti-corruption message in her inaugural address before the city legislature. "We are beginning a new era of honesty and eradicating the privileges long enjoyed by top officials," she said. She vowed to end "the privatization of public spaces" and excessive fines and taxes in the sprawling capital of more than eight million inhabitants, whose greater urban area is home to some 20 million people. Another woman previously served as mayor of the capital on an interim basis -- Rosario Robles, from 1999 to 2000 -- but Sheinbaum, who holds a doctorate in physics, is the first woman elected to the post. Sheinbaum was an early ally of Lopez Obrador, who was himself Mexico City mayor from 2000 to 2005. She was among the first politicians to leave Mexico's established left-wing party, the Party of the Democratic Revolution (PRD), and join Lopez Obrador's breakaway, Morena, when he formally launched it in 2014. The following year, she won an election for district mayor of Mexico City's Tlalpan neighborhood, Lopez Obrador's own district and one of the 16 "delegations" that make up the city. That was her launch pad for her mayoral campaign. But her rapid rise has not been without controversy. When a private elementary school in her district collapsed in the earthquake that rocked Mexico on September 19, 2017 -- killing 19 children and seven adults inside -- it emerged that the local government had granted dodgy construction permits to the school's owner, who is today on the run from the law. A group of victims' families has brought criminal charges over the case, and wants Sheinbaum to face investigation. Sheinbaum vehemently denies responsibility, and accuses her opponents of exploiting the tragedy for political gain.